1.7 Shita-kiri Suzume, "Tongue-Cut Sparrow,"
1.8 The story of the vengeful Kiyohime, who became a dragon. 1.9 Banchō Sarayashiki, the ghost story of Okiku and the Nine Plates. Japanese folklore has been influenced by foreign literature. Some stories of ancient India were influential in shaping Japanese stories, though Indian themes were greatly modified and adapted to appeal to the sensibilities of common people of Japan. The monkey stories of Japanese folklore show the influence of both by the Sanskrit epic Ramayana and the Chinese classic “The Journey to the West.”. The stories mentioned in the Buddhist Jataka tales appears in a modified form in throughout the Japanese collection of popular stories. Japanese folklore often involves humorous or bizarre characters and situations, and also includes an assortment of supernatural beings, such as bodhisattva, kami (gods and revered spirits), yōkai (monster-spirits) (such as oni, similar to Western demons, ogres, and trolls), kappa (河童, "river-child," or gatarō, 川太郎, "river-boy," or kawako, 川子, "river-child," a type of water sprite), and tengu (天狗, "heavenly dogs"), yūrei (ghosts), Japanese dragons, and animals with supernatural powers such as the kitsune (fox), tanuki (raccoon dog), mujina (badger), and bakeneko (transforming cat). Japanese folklore is often divided into several categories: "mukashibanashi," (tales of long-ago); "namidabanashi," (sad stories); "obakebanashi," (ghost stories); "ongaeshibanashi," (stories of repaying kindness); "tonchibanashi," (witty stories); "waraibanashi," (funny stories); and "yokubaribanashi," (stories of greed). In the middle years of the twentieth century storytellers would often travel from town to town telling these stories with special paper illustrations called kamishibai. A child of superhuman strength, Kintaro was raised by a mountain ogress on Mount Ashigara. He became friendly with the animals of the mountain, and later, he became Sakata no Kintoki, a warrior and loyal follower of Minamoto no Yorimitsu. It is a Japanese custom to put up a Kintarō doll on Boy's Day, in the hope that the sons of the family will become equally brave and strong. His name literally means Peach Tarō; as Tarō is a common Japanese boy's name, it is often translated as Peach Boy. 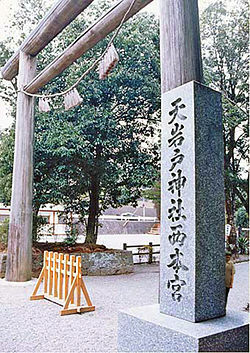 Momotarō is also the title of various books, films, and other works that portray the tale of this hero. According to the present form of the tale (dating to the Edo Period), Momotarō came to earth inside a giant peach, which was found floating down a river by an old, childless woman who was washing clothes there. The woman and her husband discovered the child when they tried to open the peach to eat it. The child explained that he had been sent by Heaven to be their son. The couple named him Momotarō, from momo (peach) and tarō (eldest son in the family). Years later, Momotarō left his parents for an island called "Onigashima" to destroy the marauding oni (demons or ogres) that dwelt there. En route, Momotarō met and befriended a talking dog, monkey, and pheasant, who agreed to help him in his quest. At the island, Momotarō and his animal friends penetrated the demons' fort and beat the demons' leader, Ura, as well as his army, into surrendering. Momotarō returned home with his new friends, and his family lived comfortably from then on. Urashima Taro was fishing one day when he spotted a turtle, which appeared to be in trouble. Urashima kindly saved the turtle, and I return, the turtle took Urashima to the Dragon Palace, deep underwater. There, Urashima met a lovely princess and spent a few days under the sea (the magic of the turtles had given him gills). However, he did not realize that time in the Dragon palace passed much more slowly than on the land, and that during those few days underwater, three hundred years had passed on land. When Urashima wanted to return to dry land, the princess gave him a box, containing his true age, but did not tell him what was inside. She instructed him never to open the box. When returned home, he found that all his family had died. Stricken with grief, he opened the box, which released a cloud of white smoke, causing Urashima to age and die. An old couple lived alone and childless. The old woman wished to have a child, despite her old age, even if he was only one inch tall. Soon after, the old woman's wish was granted. They named the miniature child Issun-bōshi ("One-Inch Boy"). The child, though he was incredibly small, was treated well by his parents. One day, the boy realized he would never grow taller than one inch, and went on a trip to seek his place in the world. Fancying himself a miniature samurai, Issun-bōshi was given a sewing needle for a sword, a rice bowl boat, and chopsticks for oars. He sailed down river to the city, where he petitioned for a job with the government and went to the home of a wealthy daimyo, whose daughter was an attractive princess. He was scorned for his small size, but was nevertheless given the job of accompanying the princess as her playmate. While they traveled together, they were suddenly attacked by an Oni (or an ogre in some translations). The boy defeated this demon using his needle, and the Oni dropped his magical Mallet of Luck. As a reward for his bravery, the princess used the power of the mallet to grow him to full size. Issun-bōshi and the princess remained close companions and eventually wed.
“Bunbuku Chagama” roughly translates to "happiness bubbling over like a tea pot." The story tells of a poor man who found a tanuki (raccoon dog) caught in a trap. Feeling sorry for the animal, he set it free. That night, the tanuki came to the poor man's house to thank him for his kindness. The tanuki transformed itself into a chagama and told the man to sell him for money. The man sold the tanuki-teapot to a monk, who brought it home and, after scrubbing it harshly, set it over the fire to boil water. Unable to stand the heat, the tanuki teapot sprouted legs and, in its half-transformed state, ran away. The tanuki returned to the poor man with another idea. The man would set up a 'roadside attraction' (a little circus-like setup) and charge admission for people to see a teapot walking a tightrope. The plan worked, and each gained something good from the other; the man was no longer poor and the tanuki had a new friend and home. The story of a kind old man, his avaricious wife, and an injured sparrow. The story explores the effects of greed, friendship, and jealousy. The story of the vengeful Kiyohime, who became a dragon. 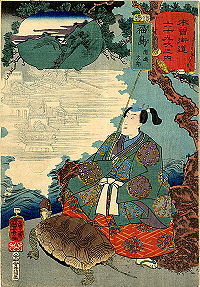 Banchō Sarayashiki, the ghost story of Okiku and the Nine Plates. Kachi-kachi is an onomatopoeia of the crackling sound a fire makes, and yama means "mountain," the rough translation is "Fire-Crackle Mountain," one of the few Japanese folktales in which a tanuki (raccoon-dog) is the villain, and confronts a heroic rabbit. The story of the old man that made the flowers bloom. An old childless couple loved their dog. One day, it dug in the garden, and they found a box of gold pieces there. A neighbor thought the dog must be able to find treasure, and arranged to borrow the dog. When it dug in his garden, the dog uncovered only bones, and he killed it. He told the couple that the dog had just dropped dead. They grieved and buried it under the fig tree where they had found the treasure. One night, the dog's master dreamed that the dog told him to chop down the tree and make a mortar from it and pound rice in the mortar. He told his wife, who said they must do as the dog asked. When they did, the rice put into the mortar turned into gold. The neighbor borrowed the mortar, but his rice turned to foul-smelling berries, and he and his wife smashed and burned the mortar. That night, in a dream, the dog told his master to take the ashes and sprinkle them on certain cherry trees. When he did, the cherry trees came into bloom, and the Daimyo (feudal lord), who was passing by, marveled at this and gave him many gifts. The neighbor tried to do the same, but his ashes blew into the Daimyo's eyes, so he threw him into prison; when he was released, his village would not let him live there anymore, and he could not, with his wicked ways, find a new home. A tale about a mysterious girl called Kaguya hime who is said to be from the capital of the moon. Mainstream Japanese myths, as generally recognized today, are based on the Kojiki, Nihonshoki and some complementary books. The Kojiki or "Record of Ancient Things" is the oldest recognized book of myths, legends, and history of Japan. 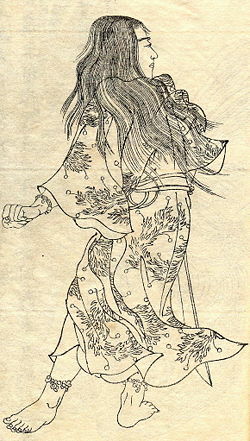 The Shintoshu, (神道集), a Japanese mythological book regarding Shinto myths, explains origins of Japanese deities from a Buddhist perspective while the Hotsuma Tsutae (Hotuma Tsutaye or Hotuma Tsutahe, 秀真伝) is an elaborate epic of Japanese mythical history which is substantially different from the mainstream version recorded in the Kojiki and the Nihon Shoki or Nihongi. The deities of Japanese mythology have multiple aliases, and some of their names are so long that they can be tedious for the majority of readers. Below is a list of the most prominent names, and their abbreviated forms. Other abbreviated forms are also in use. For instance, Ninigi, or Ame-Nigishikuni-Nigishiamatsuhiko-Hikono-no-Ninigi-no-Mikoto in full, may also be abbreviated as Hikoho-no-Ninigi or Hono-Ninigi. Proper names are sometimes written in a historical manner. In this article, underlined h, y, and w denote silent letters which are usually omitted from modern spelling. This underlining convention is peculiar to this article. Other syllables are modernized as follows (see also Japanese language). Note that some blend of these conventions is also often used. hu is modernized as fu. oo is modernized as o or oh. For instance, various spellings of Ohonamudi include Ohonamuji, Oonamuji, Ohnamuji, and others. For historical reasons, k, s, t, and h are sometimes confused with g, z, d, and b respectively. The first gods summoned two divine beings into existence, the male Izanagi and the female Izanami, and charged them with creating the first land. To help them do this, Izanagi and Izanami were given a halberd decorated with jewels, named Amanonuhoko (Heavenly Halberd of the Marsh). The two deities then went to the bridge between heaven and earth, Amenoukihashi (Floating Bridge of Heaven) and churned the sea below with the halberd. When drops of salty water fell from the halberd, they formed into the island Onogoro (self-forming). Izanagi and Izanami descended from the bridge of heaven and made their home on the island. Eventually they wished to mate, so they built a pillar called Amenomihashira around which they built a palace called Yahirodono (the hall whose area is eight arms' length squared). Izanagi and Izanami circled the pillar in opposite directions, and when they met on the other side Izanami, the female deity, spoke first in greeting. Izanagi didn't think that this was proper, but they mated anyway. They had two children, Hiruko (watery child, Ebisu, (恵比須, 恵比寿, 夷, 戎, Yebisu,) or Kotoshiro-nushi-no-kami, (事代主神), the Japanese god of fishermen, good luck, and workingmen, as well as the guardian of the health of small children and the only one of the Seven Gods of Fortune (七福神, Shichifukujin) to originate from Japan; and Awashima (pale island) but they were badly-formed and are not considered deities. Note that Hokkaidō, Chishima, and Okinawa were not part of Japan in ancient times. They bore six more islands and many deities. Izanami, however, died giving birth to the child Kagututi (incarnation of fire) or Ho-Masubi (causer of fire). She was then buried on Mount Hiba, at the border of the old provinces of Izumo and Hoki, near modern-day Yasugi of Shimane Prefecture. In anger, Izanagi killed Kagututi. His death also created dozens of deities. Susanoo (incarnation of storms and ruler of the sea) from his nose. Amaterasu, the powerful sun goddess of Japan, is the most well-known deity of Japanese mythology. Her feuding with her uncontrollable brother Susanoo, is equally infamous and appears in several tales. One story tells of Susanoo's wicked behavior toward Izanagi. Izanagi, tired of Susanoo's repeated complaints, banished him to Yomi. Susanoo grudgingly acquiesced, but had to attend to some unfinished business first. He went to Takamagahara (heaven, 高天原, the dwelling place of the Kami, believed to be connected to the Earth by the bridge Ama-no uki-hashi, the "Floating Bridge of Heaven".) to bid farewell to his sister, Amaterasu. Amaterasu knew that her unpredictable brother did not have good intentions and prepared for battle. "For what purpose do you come here?" asked Amaterasu. "To say farewell," answered Susanoo. All the gods and goddesses in their turn strove to coax Amaterasu out of the cave, but she ignored them all. Finally, the “kami” of merriment, Ama-no-Uzume, hatched a plan. She placed a large bronze mirror on a tree, facing Amaterasu's cave. Then Uzume clothed herself in flowers and leaves, overturned a washtub, and began to dance on it, drumming the tub with her feet. Finally, Uzume shed the leaves and flowers and danced naked. All the male gods roared with laughter, and Amaterasu became curious. When she peeked outside from her long stay in the dark, a ray of light called "dawn" escaped and Amaterasu was dazzled by her own reflection in the mirror. The god Ameno-Tajikarawo pulled her from the cave and it was sealed with a holy shirukume rope. Surrounded by merriment, Amaterasu's depression disappeared and she agreed to return her light to the world. Uzume was from then on known as the kami of dawn as well as mirth. Ōnamuji (大国主, "Great Land Master,” also known as Ōkuninushi) was a descendant of Susanoo. He was originally the ruler of Izumo Province, until he was replaced by Ninigi. In compensation, he was made ruler of the unseen world of spirits and magic. He is believed to be a god of nation-building, farming, business and medicine. He, along with his many brothers, competed for the hand of Princess Yakami of Inaba. While travelling from Izumo to Inaba to court her, the brothers met a skinned rabbit lying on a beach. Seeing this, they told the rabbit to bathe in the sea and dry in the wind at a high mountain. The rabbit believed them and thereby suffered in agony. Ōnamuji, who was lagging behind his brothers, came and saw the rabbit in pain and instructed the rabbit to bathe in fresh water and be covered with powder of the "gama" (cattail) flower. The cured rabbit, who was in reality a deity, informed Ōnamuji it was he who would marry Princess Yakami. The trials of Ōnamuji were many and he died twice at the hands of his jealous brothers. Each time he was saved by his mother Kusanda-hime. Pursued by his enemies, he ventured to Susanoo's realm where he met the vengeful god's daughter, Suseri-hime. The crafty Susanoo tested Ōnamuji several times but in the end, Susanoo approved of the young boy and foretold his victory against his brothers. Although the Yamato tradition attributes the creation of the Japanese islands to Izanagi and Izanami, the Izumo tradition claims Ōnamuji, along with a dwarf god called Sukunabiko, contributed to or at least finished the creation of the islands of Japan. the sword Kusanagi (a possible replica of which is now in Atsuta Shrine, Nagoya). Ninigi met the Princess Konohana-sakuya (symbol of flowers), the daughter of Yamatumi (master of mountains), and they fell in love. Ninigi asked Yamatumi for his daughter's hand. The father was delighted and offered both of his daughters, Iwanaga (symbol of rocks) and Sakuya (symbol of flowers). But Ninigi married only Sakuya and refused Iwanaga. Yamatumi said in regret, "Iwanaga is blessed with eternity and Sakuya with prosperity; because you refused Iwanaga, your life will be brief from now on." Because of this, Ninigi and his descendants became mortal. Sakuya conceived by a night and Ninigi doubted her. To prove legitimacy of her children, Sakuya swore by her luck and took a chance; she set fire to her room when she had given birth to her three babies. By this, Ninigi knew her chastity. The names of the children were Hoderi, Hosuseri, and Howori. Hoderi lived by fishing in sea while his brother Howorilived by hunting in mountains. One day, Hooori asked his brother to swap places for a day. Hooori tried fishing, but he could not get a catch, and what was worse, he lost the fishhook he borrowed from his brother. Hoderi relentlessly accused his brother and did not accept his brother's apology. While Hooori was sitting on a beach, sorely perplexed, Shihotuti told him to ride on a ship called the Manasikatuma and go wherever the current went. Following this advice, Hooori reached the house of Watatumi (Master of Seas), where he married Toyotama, the daughter of Watatumi. After three years of marriage, he remembered his brother and his fishhook, and told Watatumi about it. Watatumi soon found the fishhook in the throat of a bream and handed it to Hooori. Watatumi also gave him two magical balls, Sihomitutama, which could cause a flood, and Sihohirutama, which could cause an ebb, and sent him off, along with his bride, to land. As Toyotama was giving birth, she asked Hooori not to look at her delivery. However, Hooori, filled with curiosity, peeped in, and saw her transforming into a shark at the moment his son, Ugaya, was born. Aware of this, Toyotama disappeared into sea and did not return, but she entrusted her sister Tamayori with her yearning for Hooori. Ugaya married his aunt Tamayori and had five children, including Ituse and Yamatobiko. The first legendary emperor of Japan was Iwarebiko, posthumous known as “Emperor Jimmu,” who established the throne in 660 B.C.E. His pedigree is summarized as follows. Iwarebiko is a son of Ugaya and Tamayori. Ugaya is a son of Howori and Toyotama. Howori is a son of Ninigi and Sakuya. Ninigi is a son of Osihomimi and Akidusi. Osihomimi is born from an ornament of Amaterasu. Amaterasu is born from the left eye of Izanagi. Izanagi is born of his own accord. Yamato Takeru subjugates Kumaso Takeru. History of "Japanese folklore and mythology"
This page was last modified on 24 March 2018, at 22:13.